Presidents Day is celebrated on the third Monday in February, which falls on February 18th in 2019. Lots of pups have become the First Dog of the United States in our nation’s history, and while some rise to the occasion with decorum and grace, others just act like regular dogs. We all have to deal with our pups misbehaving at times. However, it’s rare that the national spotlight is capturing every time they act naughty. It’s a lot of pressure for a Presidential pooch, but somehow the stories of First Dogs acting up are even more endearing than when they’re well-behaved. Here are five stories of Presidential dogs misbehaving. Some misbehavior is encouraged, as was the case with President Warren Harding’s Airedale Terrier, Laddie Boy. 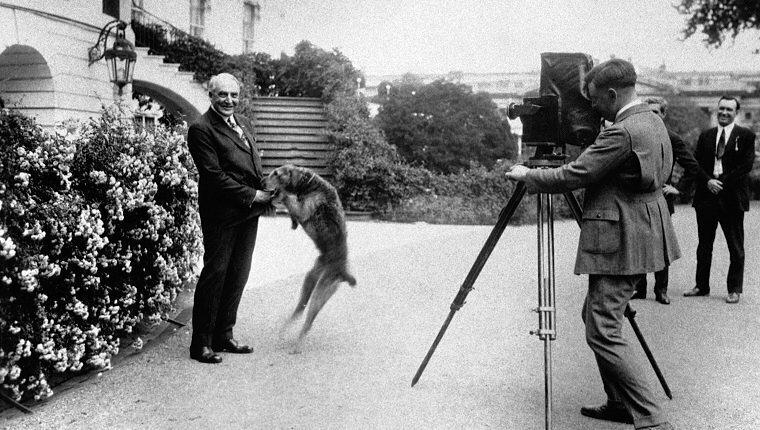 This pup wasn’t the first dog in the White House, but he was the first to be famous. The press loved him, and he became the mascot for animal rights in the country. Laddie Boy would sit in on cabinet meetings on his own hand-crafted chair and attended all sorts of events. He even had a Presidential pooch’s birthday with neighbor pups and a cake made of dog biscuits. Laddie Boy also did his share of misbehaving, sometimes crashing press photo opportunities with his President dad, and he was once in the paper for treeing a White House cat. The dog’s rambunctious behavior was especially encouraged at one place in particular–the golf course. Whenever Harding played golf, his pup came along. Harding sometimes hit a misdirected shot, and whenever he struck a tree, Laddie Boy would faithfully run after the golf ball and return it to his owner. Yep, this Presidential pooch was a cheater at golf. Although, somehow I doubt Harding had much of a problem with this little bit of interference. It was likely even rewarded. 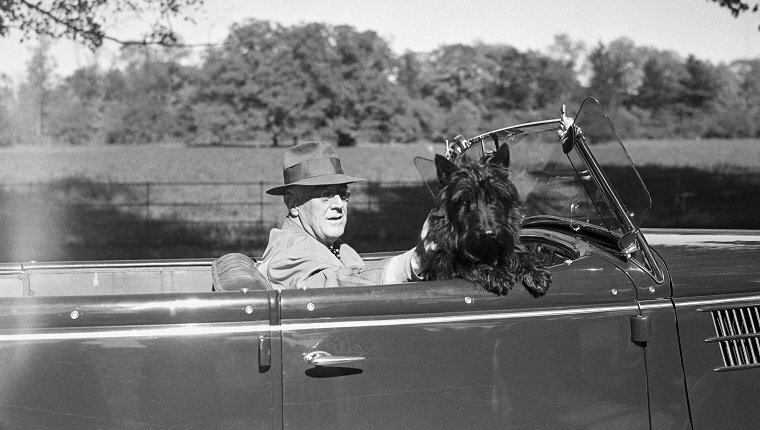 A misbehaving pooch sometimes needs accomplices, and Franklin Delano Roosevelt’s Scottish Terrier, Fala, was likely the ring leader of the White House kitchen staff. Fala first gained infamy when Republican opponents in Congress spread a story that Roosevelt had left the pup on the Aleutian Islands and had sent a U.S. Navy destroyer to go back and get him, which cost the taxpayers millions. Roosevelt famously dismissed this story in a funny dinner speech that was broadcast over the radio. To this day, it is one of the most remembered Presidential speeches in history. FDR defended his pooch from opponents, but the President had to take action to defend Fala from himself. The pup apparently mastered the puppy-dog-eyes before regularly sneaking into the White House kitchen. The staff there couldn’t resist the pup’s cuteness, and Fala knew it. After only a few weeks at the White House, Fala went to the hospital for intestinal issues. Roosevelt found out that the kitchen staff was overfeeding the dog, so the President issued an order that only he would feed Fala from then on. The White House kitchen staff still sent up a bone for Fala every morning with Roosevelt’s breakfast tray. 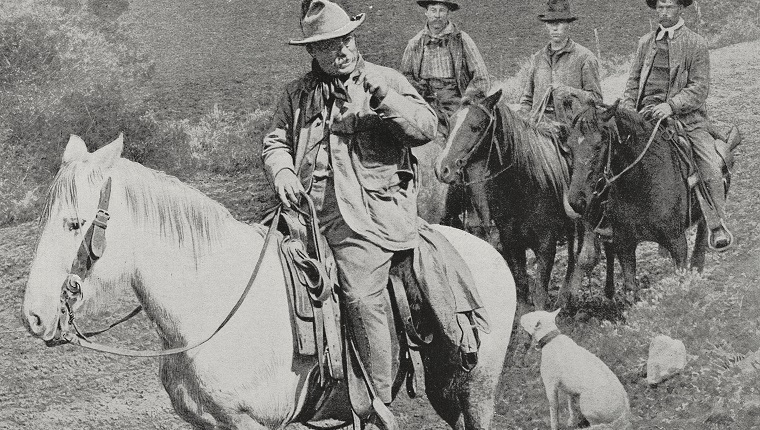 Teddy Roosevelt loved dogs and had several of them, but no pictures exist of the infamous Pete. That may be for a good reason, as the dog, believed to be a Bull Terrier or some Pit Bull mix, had a habit of nipping and snapping, so photographers may have had some trouble getting close. Pete even bit a Naval officer, but Roosevelt dismissed the bad behavior as “the nature of the breed” until one incident that almost created an international disaster. French Ambassador Jules Jusserand was visiting the White House when the poorly trained Pete caught sight of him. He chased the man down a hallway, and when he caught up, ripped the bottom of the Ambassador’s pants off. The French government didn’t like that, and rather than strain international relations, Roosevelt finally banned Pete from the White House. He went to live at the Roosevelt family’s home, Sagamore Hill in New York. When Ronald Reagan first entered the White House, he didn’t have a dog. That changed when the six-year-old poster child for the March of Dimes, Kristen Ellis, gave a Bouvier des Flandres puppy to Nancy Reagan. Nancy named the dog Lucky after her mother’s nickname, and the canine quickly grew from a tiny pup to a big, strong dog. Maybe even too strong. Lucky didn’t respond to training very well, and she often pulled the President along, walking him from her leash instead of the other way around. 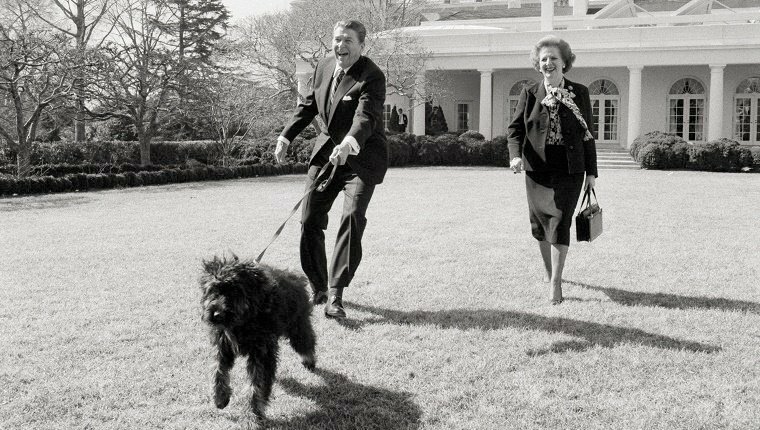 In fact, a famous photo was snapped of Reagan getting tugged across the White House lawn by the pup as British Prime Minister Margaret Thatcher hurried to keep up. It became clear that Lucky’s rowdy personality needed more room to run than the White House could provide, so she was sent to live at the Reagan’s California ranch instead. Sunny and Bo, the Obama’s Portuguese Water Dogs developed a history of naughty antics during their time at the White House despite having top-notch trainers working with them. Bo once tried to eat the microphone off of a member of the press’s camera, and Sunny seemed to enjoy pooping in the house near the Lincoln Bedroom and the Oval Office. It’s nice to know that even a President can’t escape from cleaning up after his pups. Sunny’s most shocking instance of bad behavior came at a White House Christmas event. U.S. military families were invited to attend, and Sunny got a little to excited to meet one toddler in particular. She ended up knocking the two-year-old down, though she seemed to be eager to apologize, licking the girl’s face. The girl wasn’t hurt or bothered at all and got back on her feet. Shortly after, she tried to feed Bo some holiday candy. What’s your favorite story of Presidential pups? Are you glad to see that even Presidents have to deal with misbehaving pooches? Let us know in the comments below!